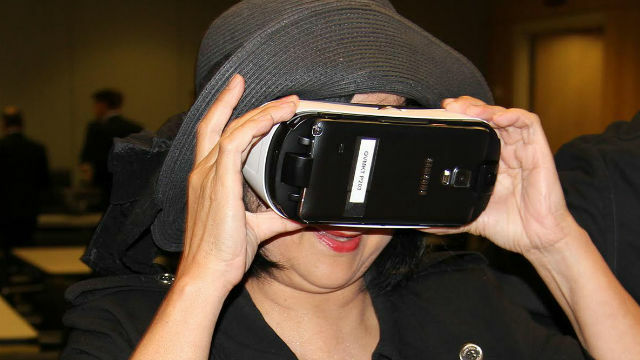 A woman tests virtual reality goggles. Virtual reality is the newest — and hottest — medium to take the world by storm. Will it replace other forms of communication like Google has largely supplanted newspapers? And how far is it developed compared to where movies, radio, television and even the printing press were in their early phases? These are among the questions “Virtual Reality — Real Or Still Virtual?” will try to answer Friday, April 22, at the Joan B. Kroc Institute for Peace and Justice, 5998 Alcala Park, on the campus of the University of San Diego. The half-day conference, sponsored by the Asian Heritage Society and San Diego Press Club, takes place 8:30 a.m. to 1 p.m. and is free and open to the public. Seating is limited and registration is required by going to the Asian Heritage Society and San Diego Press Club websites, respectively, at www.asianheritageawards.com or www.sdpressclub.org. Shuttle service is available from the university parking lot off the Alcala Park entrance. Leading experts in the field will explore how virtual reality is used in narration, not only in covering news events but in providing historical perspective, how it is already being used in the operating room and tackling psychological problems such post-traumatic stress, and how it already is on the way to replacing teachers in the classroom. Opportunities will be available to experience virtual feality firsthand, as well. They include Barry Sandrew, founder of Legend3D and long recognized as an entrepreneur, digital imaging expert and visual effects pioneer; Brian Levine founder of the San Diego Virtual Reality Meetup, a group of local VR professionals and enthusiasts, whose mission is to educate the community about Virtual Reality; Nonny de la PeÑa, ”Godmother of Virtual Reality,” known for pushing technological boundaries for narrative endeavors, including exploring 3D environments for fiction, news, and documentary; Arno Hartholt, a computer scientist with the Institute for Creative Technologies at the University of Southern California and project leader of the Integrated Virtual Humans group, including applications for tackling post-traumatic stress; Casey Sapp, CEO and founder of VRTUL Inc., a San Diego-based startup that develops 360-degree VR content; and Matt DeJohn, who has more than ten years of experience as visual effects supervision and production in dozens of feature films, including the Spiderman franchise. They will be joined by Bennett Peji, a senior director at the Jacobs Center for Neighborhood Innovation, brand consultant, designer and frequent international speaker on community-centered design; Dean Nelson, director of the journalism program at Point Loma Nazarene University; and Barbara Bry, chief operating officer of Blackbird Ventures, who will discuss the importance of early stage technologies to the importance of San Diego as an innovation hub. Introductory remarks will be provided by San Diego County Supervisor Dave Roberts. For more on the speakers or to register, go to www.asianheritageawards.com.